With smart contacts, a great number of processes have experienced a real revolution becoming much more transparent and reliable. Such technologies have been introduced in a wide range of different spheres and online gambling is not an exception. If earlier people used to be rather skeptical about this industry, today everything has changed. Owing to modern techs and innovative financial solutions, online gambling has become absolutely user-friendly and user-oriented. Xether is just an excellent example to prove it. This gambling ecosystem is built to change the game. One of its main principles is to take care of its users, continuously enhancing their experience. 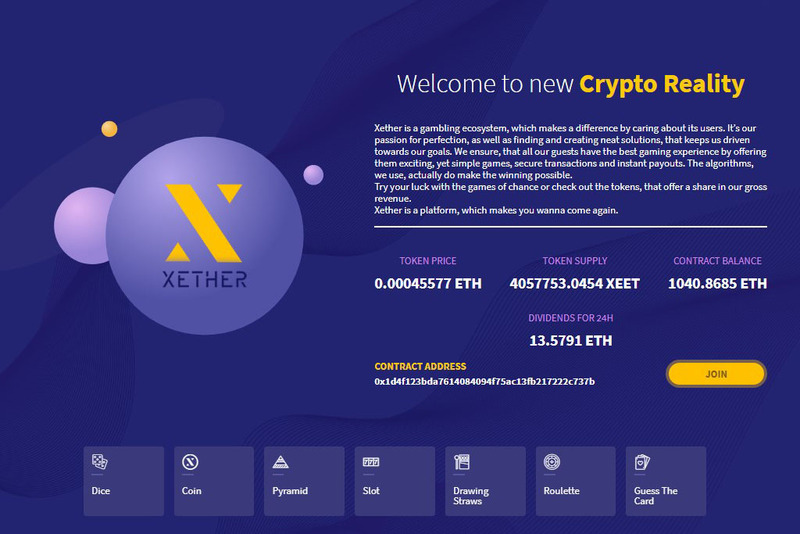 While some people still believe that it is impossible to win playing online games, the algorithms applied by Xether make the winning absolutely real. Moreover, clear interface, simple games rules, safe transactions, and instant payouts are aimed at showing users what online gambling should look like today. To facilitate playing as much as possible Xether allows users to play for ETH without signing up. The team staying behind Xether believes that fairness should be one of the main values in this spheres: nobody should have a possibility to interfere in the process and influence the results of games. The outcome should be always available for independent audits at any moment. “Most gambling projects don’t show their real balance, so nobody can be sure whether they get their win in the end. Others may have withdrawal limitations in place. All calculations and results are generated on a centralized server that conceals all those processes making them non-auditable. If a user wants to play, it is just enough to have some ETH holdings on a wallet. At the current moment such games as pyramid, coin toss, dice, roulette, and slot simulator are available, but it is planned to add poker and sports betting as well. Moreover, it is possible that on the future Xether will collaborate with other smart contract platforms. How to Earn with Xether? With a view of expanding its users earning opportunities, Xether offers them to purchase casino tokens which ensure their holders a stable passive income. This income is shaped from dividends on the token turnover and the fee that casino applies to winnings. The amount is distributed them between token holders proportionally to their share by the core smart contract as soon as a certain amount of fees is accumulated. It’s also important to highlight that these tokens that players can purchase are not a mandatory requirement to have a possibility to play games on the platform. Users can buy them to get profits but are not required to do it if they don’t want to.